Based on reviews from 60 experts and 2,082 users. Learn how our rankings work or see our guide to LeBron James basketball shoes. Updated Apr 2019. LeBron Raymone James, or more known as LeBron, is a Ohio-born professional basketball athlete. 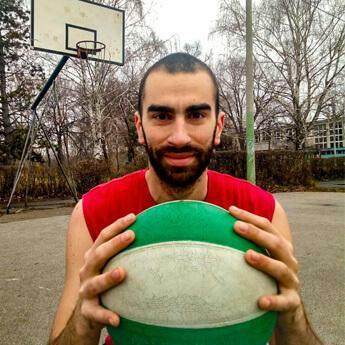 He currently plays both as the small forward and power forward of the Cleveland Cavaliers. Looking at LeBron’s current record, his career screams a promising future, especially with the cash flowing in from his endorsement of Nike basketball shoes and other business ventures. However, before he got in the National Basketball Association, life was not easy on him. Let’s take a sneak peek of his biography. LeBron was born to sixteen-year-old Gloria Marie James on December 30, 1984. Because of the struggles of getting a stable job, she made LeBron live with Frank Walker as a foster child. He introduced basketball to him when he was nine years old. With his friends Willie McGee, Dru Joyce III, and Sian Cotton, they joined and won different basketball levels. In high school, James was active in both football and basketball. As a footballer, he led the Fighting Irish to the semifinals; but he decided to stop after he injured his wrist in a basketball game. As a basketball player, James was hailed by writer Ryan Jones as “the best high school basketball player in America right now” when he was featured in SLAM Magazine. With all the successes he earned in his high school years as a basketball athlete, he attempted but failed to enter the 2002 NBA Draft due to the league requirement of at least a high school diploma. LeBron’s professional basketball career commenced in 2003 when he became the first overall draft pick of the Cleveland Cavaliers. He earned the Rookie of the Year award at the end of the season. As a fresh twenty-year-old player, everyone in the league is amazed and threatened by his speedy improvement to becoming one of the NBA greats. In 2006, he won the the NBA All-Star Game Most Valuable Player but lost the NBA Most Valuable Player Award to Steve Nash. James won his second All-Star Game MVP award in the 2007-08 season. In the 2008-09 season, he lost the NBA Defensive Player of the Year to Dwight Howard and achieved his first NBA All-Defensive Team. He was the first Cavalier to garner the MVP award and did it twice in a row for 2009 and 2010. In July 2010, LeBron chose to become an unrestricted free agent, which meant he had the freedom to sign with any team of his choice. A handful of major teams reached out to him; LBJ chose the Miami Heat. He joined the likes of Chris Bosh and Dwyane Wade in taking care of the team’s offensives. This sudden decision left a bad taste in everyone’s mouth and made him one of America's most disliked athletes. As a member of the Miami Heat, LeBron had high hopes of leading the team to the championship, but they lost to the Dallas Mavericks. This loss created a storm of criticism against LeBron who reacted by training harder offseason with Hakeem Olajuwon. As a result, he finished the 2011-12 season with his third MVP award. The year after, he won his fourth MVP award after the Miami Heat had streak of 27 wins. In mid 2014, LeBron again chose to be an unrestricted free agent and expressed desire to return to the Cavs, which was well-received and made official on July 12, 2014. With Kevin Love and Kyrie Irving, LeBron brought the Cavaliers to the NBA Finals, but they lost to the Golden State Warriors. 2016 was a low for the team and LeBron James. Despite the losses, injuries, and criticisms incurred during the season, the Cavs were still able to face and defeat the Warriors in the NBA Finals. The 2018 All-Star Weekend will be held on February 18 at the Staples Center in Los Angeles, California. LeBron James, with coach Dwane Casey, leads a team of his hand-picked All-Stars like Kevin Durant and Anthony Davis. They will face the the team that is led by Stephen Curry with coach Mike D'Antoni. Curry’s team has James Harden and Damian Lillard. LeBron James is undeniably one of the fattest cash cows of Nike to date. Being one of the best basketball players in the world, he is meticulous with the design of every shoe that comes out of his signature line. Business-wise, LBJ is aware that the majority of the wearers of his shoes are off-court, therefore he makes sure that the designs are hot and aesthetically appealing. He has mentioned in his interviews that aside from the design, he wants to ensure the comfort of the shoe. In 2003, the then 18-year-old LeBron signed a $90-million seven-year contract with Nike. He was already a millionaire before he even got drafted. In 2010, he renewed his contract to earn a whooping $30 million annually. He is also the first, and probably the last, basketball athlete to sign a lifetime deal with the Swoosh. They say behind a man’s success is a woman. In the case of LeBron James basketball shoes, the woman is the technologies that propel them to greatness. Behind each shoe is a story of technological evolutions involving materials and designs. LeBron basketball shoes are reportedly the second best selling shoes next to Michael Jordan basketball shoes. Air Zoom Generation. Designed by creative geniuses Aaron Cooper, Eric Avar, and Tinker Hatfield, the Nike Air Zoom Generation is the first pair of LeBron James shoes that do not bear his name in its official model title, though some call it LeBron 1. Synthetic leather and ballistic mesh compose the upper of the shoe. With the help of the Sphere Technology, ventilation in the shoe is ensured. The herringbone traction pattern on the outsole has helped King James with his multidirectional footwork. The carbon fiber in the midfoot provides the much-needed stability. Though this shoe does not have his name, the design comes from the controversial fully-customized black Hummer H2 his mother gave to him on his 18th birthday. It resembles the modern-day soldier in LeBron’s character. A retro of this model was released in December 2017, and it retails at $175. Jason Petrie’s wish to design LeBron’s signature shoes comes true with the 7th up to the 15th models. Different technologies are applied to ensure that the basketball demands of King James are met. He also takes into consideration the new techs created in the Swoosh lab. As the model number increases, the modernity of the technologies used gets obvious. According to Petrie, Nike LeBron shoes must keep up as the King’s skills get better. Air Max LeBron VII. When Jason Petrie became the designer of LeBron basketball shoes, he made sure that such Nike shoes are able to contain the explosive court moves of the celebrated small forward. 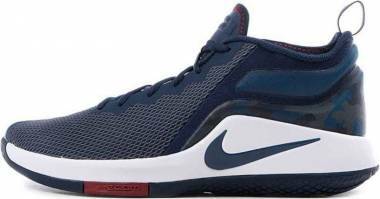 In a 2009 interview, he said that the shoe is now part of a new stage in the King’s basketball career and has to create a statement through a total overhaul of the previous designs. He wanted to put an ambitious amount of revolution to the shoe by putting a 360 Air Max bag on the midsole and Flywire technology in a seamless upper. He added that the Air Max unit on the LeBron 7 has 80% more air than the ones in previous Nike sneakers. This beast was released on October 4, 2009. LeBron 9. These LeBron basketball shoes are legit performers on the court because of their stability and flexibility. The cushion boasts a Zoom unit at the forefoot and an Air Max unit at the heel. These two create an impressive underfoot experience by absorbing impact and preventing stress on the knees. However, the shoe has its flaws. The Nike Pro Combat is a technology designed to deliver comfort around the foot through EVA foam pads. Even with their good intentions, this technology still received mediocre feedback because for some, the foam just causes irritation to the foot. 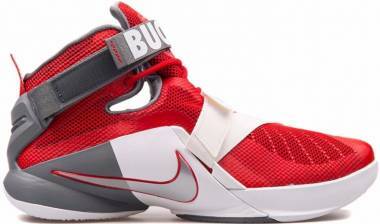 These LeBron sneakers were released on October 25, 2011 in the black and red colorway. LeBron 10. Like the other Nike LeBron shoes, this model has impressive reviews. It defines LeBron as a basketball athlete: aggressive, strong, and driven. The upper is made of flexible and luxurious Fuse material and equipped with Flywire for better support. The diamond pattern on the outsole helps LeBron with this hard jumps and stops without any slipping or sliding. These LeBron sneakers debuted at the 2012 Summer Olympics in July. LeBron 11. The LeBron XI is a good shoe, but it had raised some eyebrows because the King did not wear this pair frequently during the 2014-15 season. The midsole has a full-length Zoom with a Lunarlon carrier. The combination provides adequate responsiveness and impact absorption. The Flywire technology at the midfoot paired with the TPU at the heel counter results in a good lockdown and foot containment. 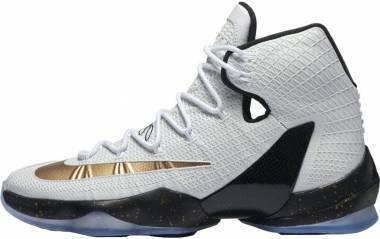 These LeBron basketball shoes were released on October 12, 2013. LeBron 12. The LeBron 12 is one of the most talked-about items on the LeBron shoes list. On the outsole, hexagon Zoom Air pods are meticulously placed to map out the foot’s pressure points. Considering King James’s aggressive style of play, support is more than necessary. 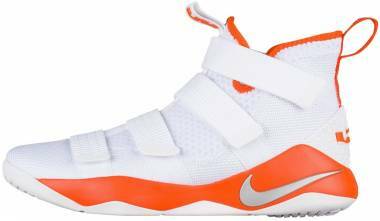 Hence, these Nike LeBron shoes’ uppers are equipped with Flywire at the midfoot to tighten its grip on the foot. These LeBron sneakers were released worldwide on October 11, 2014 at $200 to $275, depending on the colorway. 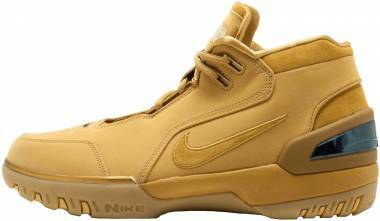 Low-top versions of these Nike basketball shoes were also released sometime later. LeBron 13. 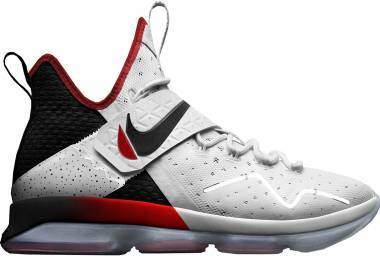 Through NIKEiD, these 13th pair of signature LeBron shoes were released on September 30, 2015 at $200. 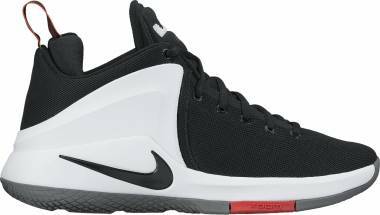 Jason Petrie designed this shoe to have a one-bootie construction with a Hyperposite and Megafuse upper that ensure stretch and foot containment. Hyperposite is a technology that combines the goodness of Hyperfuse and Foamposite. They are working together to provide breathability and durability to the shoe. The Zoom Air units are in the hex pods on the outsole, ensuring responsiveness and impact protection with every step. Low-top versions of this, which are aptly called the LeBron XIII Low Premium, were also released sometime later. LeBron 14. The mid-top silhouette of the LeBron 14 is made stable by the thermoplastic polyurethane (TPU) in the midsole. This setup is complemented by Zoom and Phylon for a sleek heel-to-toe transition. For a good stopping power, the translucent rubber outsole is divided into multiple hexagonal units that feature unique digital patterns. Aside from its traditional lacing style, the midfoot strap offers better lockdown and foot containment. During its release on February 10, 2017, it retailed at $175. LeBron 15. The LeBron 15 is one of Jason Petrie’s most loved signature Nike LeBron shoes. These high-top basketball shoes are the first to have Battleknit in the upper. Battleknit is an innovated high-grade Flyknit material specifically created for LeBron. It reduces the weight of the shoe without compromising the comfort, durability, and flexibility of the shoe. Another lightweight and brand new feature of the shoe model is the combination of Zoom and Air Max, which were once considered by many as impossible to put together. This tooling delivers more than just the impact protection that a big man like LBJ needs; it also returns significant amounts of energy. These Lebron James 15 shoes are currently the latest in the line, and it has gone through numerous transformations. Some of the most talked-about versions are the performance shoes in the Nike x KITH “Long Live the King” collection. 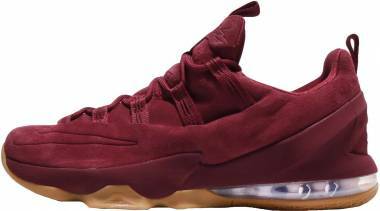 Aptly called the “King’s Cloak” and “Suit of Armor,” these releases feature embroidered uppers that allude to the royal status that LeBron James currently enjoys in the NBA. Lebron 16. 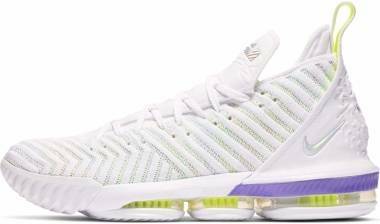 The LeBron 16 features the upgraded Battleknit upper from the LeBron 15. This innovation used the Shima machine to build a really strong woven fabric. For a customized and secure fit, the midfoot is equipped with Flywire technology. For a comfortable performance, the outsole has a modified traction pattern for a good grip. The cushioning of the LeBron 16 is made better as well. The tendril that connects the forefoot and midfoot Max Air unit bags. The 16th signature shoe of LeBron James was released in September 2018. The LeBron Soldier series started around the 2007 NBA Finals. 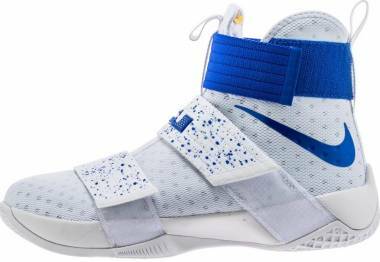 In an interview, Nike Basketball’s Senior Footwear Product Director Kevin Dodson said that the concept of the Soldier line came from a college student who said, “My perfect shoe would be a Nike Elite sock with an outsole and some straps. Nothing else.” According to Nike Product Manager Tim Day, the line is also inspired by soldiers at war who don’t have time to tie their shoes. The purpose of the lace-free signature line is to secure the foot quickly and comfortably. LeBron Soldier 10. The LeBron Soldier 10 features a three-strap lockdown system. The predominantly Phylon cushioning system comes with a Zoom unit at the heel. The upper boasts foam and triple layers of textile for a light and breathable fit. 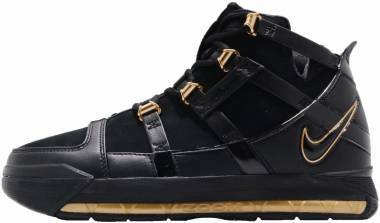 These LeBron sneakers on sale were released on June 2016 with a price range of $130 to $180. This model is also available in NIKEiD for those who want to have its look customized. LeBron Soldier 11. A signature shoe would not be LeBron’s if it does not feature at least a Zoom unit. The LeBron Soldier 11 boasts Zoom units at the forefoot and heel for impact protection like no other. Such cushioning setup keeps the legs and knees from stress and injuries. This shoe model is lace-free, and it depends on the four straps for foot security. The outsole features triangular patterns, and it comes in either solid, translucent, or gum rubber. 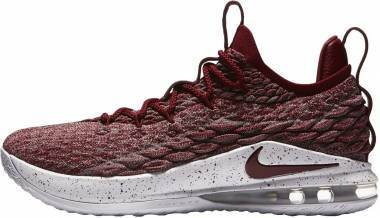 In several colorways, these LeBron sneakers on sale are available on NIKEiD. The first release of this lace-free model was on May 31, 2017. Because LeBron James is a lifetime endorser of the brand, Nike will certainly grab every opportunity to use his image to create or promote shoe lines. It is almost certain that the LeBron shoes list will continue to grow. 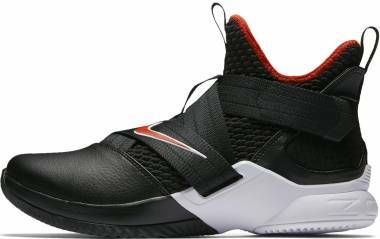 Since his original signature line is quite in the higher price range, the newly conceptualized Zoom Witness LeBron basketball shoes are budget models that are poised to attract low to middle class buyers. Another bonus is that this signature line is said to accommodate wearers with wider feet. LeBron Zoom Witness. 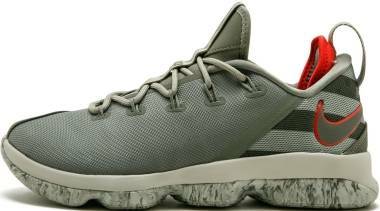 The LeBron Zoom Witness is a lightweight mid-top shoe with a mesh upper. It also has foam in the rear panel. Being a budget model, there is no chance of having luxurious materials in it. The midsole is made of Phylon with two small Zoom units at the forefoot. 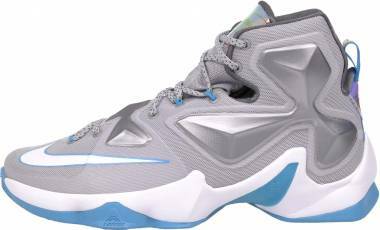 These LeBron sneakers on sale are exceptionally breathable and comfortable. However, for heavier athletes, this pair is better for lifestyle use. At only $100, no one should expect this shoe to be durable enough to be played outdoors or to last more than a season. This budget-friendly model was released on October 2016. LeBron Zoom Witness II. These LeBron sneakers sport almost the same materials and technology as its predecessor. The only tweaks made are the height of the shoe and the fuse overlays on the upper for toe drags. 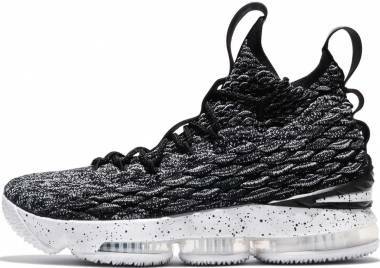 The LeBron Zoom Witness 2 was released in September 2017, just before LeBron 15 came out. It is believed that basketball shoes have a huge impact on a great athlete’s career. For the creation of the LeBron basketball shoes, innovative and creative designers involved in each line and shoe carefully crafted the technologies and materials to form an explosive signature shoe everyone in the sneaker world will remember. Presented below are the designers a.k.a magicians behind the limelight of LeBron James basketball shoes. Aaron Cooper. Currently the Design Director of the Swoosh, Aaron Cooper has been designing shoes for over two decades. A unique characteristic of this brilliant man is his penchant for not going with the trend. He prefers to be a sponge in a world full of changes and updates. As a designer for LeBron’s line, he mentioned that comfort is the most important factor in his footwear. As for Cooper, he wants to get to know the athlete in order for the shoe model to be aligned with the signature athlete’s personality. He admitted that it is difficult to combine performance and style in designs. Even so, he strives to meet the demands without compromising the quality of the shoe. Eric Avar. As the current Vice President of Design Innovation of Nike, New York-born Eric Avar is one of the top designers of Nike shoes. He is one of the geniuses who designed the famous Air Zoom Generation for LeBron James as his first shoe. Avar is also known for being the man behind the Air Penny and the various Kobe lines. Tinker Hatfield. Tinker Haven Hatfield, Jr. is currently the Vice President for Design and Special Projects in Nike. He is one of the designers of LeBron’s Air Zoom Generation and considered by many as one of the greatest designers of top Nike basketball shoes and other types of footwear. Oregon-born Hatfield has influenced a lot of today’s Nike’s best designers to approach new ideas with no hesitation. Jason Petrie. Jason Petrie is currently a Senior Footwear Designer at Nike. In the world of sneakers, he is considered as one of the 50 most influential people. As a kid back in the 80s, his first Nike pair was the Air Alpha Force. He purchased the pair for $65 after selling all his G.I. Joe toy collection at a yard sale. This young lad from North Carolina dreamed of becoming a Nike designer. He wrote the company letters, and drew pages of shoe designs. But prior to being part of Nike, he was a designer for Fila. When Kobe Bryant’s contract with Adidas was about to end, Jason had created potential designs for the him. About the same period, the young LeBron started to rise to fame and Jason knew about him when he became the cover of SLAM Magazine. In 2003, Jason entered Nike and it made him glad when LeBron and Nike signed a seven-year contract in the same year. -“Lock me down so I can fly.” This adage came from LBJ himself. -“Protect me from myself.” This is the statement in making sure the shoe keeps its comfort the entire season. -“Make me light.” This is to keep the adages steady and applied to each shoe. Signature models are designed to carry the name of the company and the athlete who endorses it. In addition to the company logo, the shoes also bear the logos of the signature athletes, most certainly as a form of identification as to who owns which shoe. 330. The “330” pays homage to Bron-bron’s hometown in Akron, Ohio. Equality. In an Instagram post in October, LBJ said, “Together we will persevere through all adversity, negativity and turn it into happiness and love!” It is clear LeBron is an activist for equal rights. The word “Equality” is on the heel counter of the Lebron 15 “Equality” PE sneakers, which come in both black and white colorways. LJ with a Crown. Debuted in December 2011, this logo is a stylized L and J monogram with a crown on top. This logo is an updated graphic that came shortly after his move to the Miami Heat and change of jersey number from 23 to 6. Lion. Nike believes that with every challenge LeBron goes through to become one of the best, he becomes stronger and more determined. The Swoosh deliberately describes him as having the heart of a lion. LeBron James is certainly one of the biggest money-makers of Nike in the past decade. His shoes are being released with no regular schedule. However, based on the LeBron shoes list that he has to date, there seems to be a trend that Nike follows for the releases. Since 2003, it has been noted that the LeBron line releases a new model annually, usually in the months of July and October. As for for the Soldier line, it has been tracked that the releases are during late spring or early summer. Nike releases the budget models in the Witness line during fall when students are about to go back to school. There is no denying that LeBron basketball shoes are one of the most sought-after in the market. A pair is retailed for up to $200. Recent reports say that chain sneaker retailers reached out to Nike to lower the skyrocket prices of signature shoe lines for better sales. Release dates. These dates are celebrated like birthdays, and only one word describes the hoopla around these dates: grand. During these times, sneaker addicts are too busy chasing the new bad boys in the market, leaving the previous models on the side rink. Thrifty buyers take advantage by going through the discounted isle where the previous models are. Why? Take note that they are not old shoes. They are simply shoe models which are past their prime, but perform just the same as they were introduced. Also, the price can still go lower if the retailer offers coupons. Spring Season. Bears are not the only beings that hibernate during snow season. Humans do too. So when the spring comes, people are starving to go out and do some outdoor activities and exercises. In the months of April and May, shoe outlets do some inventory check, and most of the older LeBron basketball shoes are moved to the discount shelves. Back to School Sale. Got kids? No problem. Fall season means going back to school. 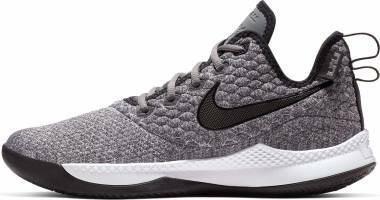 To lessen the burden of the expenses for school needs, parents can check out basketball sneakers in the discounted section of shoe stores. For sure there are LeBron James basketball shoes that can fit the youth. They can also opt to purchase during spring, keep those pairs in proper storage areas, and pull them out as soon as school starts. Black Friday. People will ask, “Why shop on a very busy Black Friday when people create a stampede for a 10-15% discount?” Wise buyers have tricks to avoid the stampede. Days before the sale, shoppers check items they want online, put them in their shopping carts, enter coupons as applicable, and save the info. As soon as midnight strikes for the Black Friday sale, they go online and purchase the items quick. The Day After Christmas. It is a day when businesses are going to be slow as families prefer to stay at home and simply be together. To get some sales, stores drop their prices and/or do some promotions, i.e. buy this and get the second item half the original price. Who knows? LeBron shoes might be among the items on promo. New Year. As the saying goes, “New Year, New Me.” It’s surely as rusty as it sounds, but seriously, who doesn’t want a beach body? The new year brings hope to people. Most promises are health-related, and many would be in a rushed and excited mood to get fit. As soon as the digit in the year changes, people run to stores to grab fitness stuff such as LeBron James basketball shoes and other sports footwear. 1. What do the initial seven colorways of the LeBron 12 mean? Some signature models release a ton of colorways in order to make some noise and eventually rake in good sales. 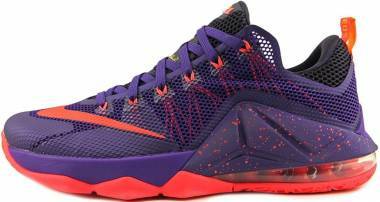 Each of the seven initial LeBron 12 colorways draws inspiration from his games, physical attributes, and playing analysis. LeBron 12 NSRL. This is considered the first public colorway. The inspiration came from the research, tests, and analysis in the Swoosh lab. LeBron 12 Heart of a Lion. For over a decade of playing basketball professionally, LBJ has been challenged both physically and mentally. This colorway reflects how brave his heart is to endure all such challenges. LeBron 12 Dunk Force. This colorway represents the signature dunk—“The Tomahawk Slam”—of King James and the force and speed of a helicopter’s blade. LeBron 12 Instinct. This colorway draws inspirations from a hummingbird. This fowl has clear eyesight. It is also fast and agile, pretty much like how LeBron moves. LeBron 12 Six Meridians. This colorway references the ancient Chinese practice of reflexology. The King receives this therapy as part of his training and preparation for his games. LeBron 12 Trillion Dollar Man. It is obvious that LeBron is where he is now because of all his hard work. This colorway represents the go-getter attitude that is effectively enhanced by Nike’s innovative technology. LeBron 12 Data. Being one of the greatest players of this generation, statistics and data can prove how dominant LeBron is on court. 2. Which of LeBron’s basketball shoes are his favorite for playing? Which is for lifestyle use? As normal human beings with a cupboard full of shoes, we play favorites with our shoes. As for LeBron, he currently has three signature lines and over twenty LeBron James basketball shoes to choose from, not to mention the colorways that total to hundreds for sure. What are his favorites among these?